The Age of Skydiving – Too Young? Too Old? The minimum age of skydiving in the US is 18. That means, to jump in the US, you have to be at least 18 years of age. But there’s no upper age limit; in fact, the oldest person to jump is 101 years old! The minimum age of skydiving is in place to ensure that the people who jump with us have the maturity to fully understand their choice. Making a skydive is an incredible thing, but it also comes with inherent risks as found in all adrenaline sports. We ask that people wait until they’re 18 to be able to make an informed decision. The benefit being that it makes an amazing 18th birthday present! So if age has no maximum limit in skydiving, what does affect whether or not we can jump? We’ve already mentioned 82-year-old skydiver Dilys Price, the oldest skydiver in the world. An inspirational lady, she talks about her passion for the sport and the freedom she feels in freefall. Check her out over on YouTube, or read on to learn more about what makes you fit to jump. Age is one factor in skydiving, but once you’re old enough, other factors come into play. Flexibility is one such factor. Knowing we have the physical flexibility to adopt the correct body position to skydive is essential. It’s that body position that keeps us falling stable in the air, in spite of wind speeds of over 120mph. Our airplanes also require an element of flexibility. While we’d love to tell you that our airplanes are decked out like a commercial flight – complete with drinks trolley and all! – sadly, we can’t. Our flights are only very short, intended to get us to our exit altitude, so we don’t have the most comfortable of seats and we’re sat in fairly close proximity to our skydiving friends. Being able to be comfortable without your own seat (sometimes sat on the floor, sometimes on a bench) is important to enjoy your experience. Another factor beyond age in skydiving is strength. 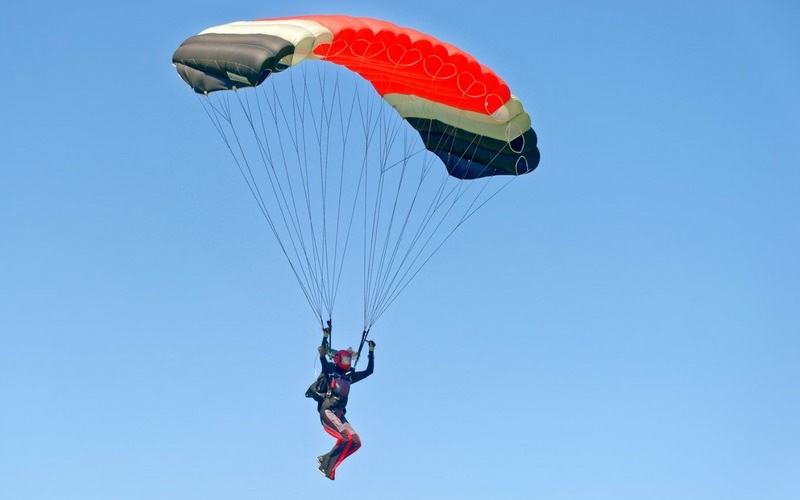 As a tandem skydiver, you’ll be attached to a highly experienced skydiving instructor. As long as you’re over the minimum skydiving age of 18, you’ll be with someone who takes control of the equipment and will do all the parachute steering and landing. But as a solo skydiver, you’ll need to be able to operate all of your own equipment. That means you’ll need a level of strength, to be able to deploy your parachute, steer it and bring it to a safe landing. One thing people don’t realize about skydiving is that the wind speed also puts pressure on your body. When we’re falling through the air, we use that wind pressure to enable us to move around the sky as if we’re flying, but that pressure can also require strength to control. For example, when falling in a seated position, your arms can get quite tired, so strength there can be beneficial. The minimum age of skydiving is in place partly to ensure that people jumping have the maturity of mind to make an informed decision. But that’s not the only reason mentality is a factor in your choice to jump. Skydiving is unlike anything you’ve done before. A lot of the people who join us are doing so because it’s been on their bucket list and they’ve always wanted to try it. There are also people who join us to get over a fear or to challenge themselves in a whole new way. Overcoming any fears and challenging yourself to actually jump from an airplane takes great strength of mind. You’ll need the mentality to take on the challenge head on, to know that your instincts might be telling you not to jump, but your head understands what you’re doing and you’re able to make the leap! Skydiving under 18 isn’t possible here in the United States. While it is possible in other places in the world, we don’t recommend it, for the reasons given here. Plus, skydiving makes for a great 18th birthday present! To book your skydive, visit our reservations page or get in touch if you have any questions about your eligibility to jump.